One of the pioneers of the early internet world was the Mosaic browser. With it came the dawn of web interface. Since then, internet technology has flourished through least two major economic bubble bursts, one in 2001 and the other in 2008. Subsequent changes in the industry led to the birth of mobile operating system. With it, the web page has gradually changed the shape to accommodate numerous new contexts. Before we could even realise, we adapted to change. From static pages to script heavy interactive pages, we gulped the change better that we’d know. There was no conscious effort needed to get accustomed with the changes that has happened over the years. In the last few years, the world of technology experienced changes at an exponential rate. Forget annual changes, we see state-of-the-art trends and contemporary modern solutions emerging every few months. Carrying the legacy forward, we will be seeing more such web development trends and updates in web development in the coming years. Before you go ahead and hire web developer to start building a brand new website, look at some of the upcoming web development trends. If you ever read or write about any list that mentions ‘upcoming’ or ‘future’, Artificial Intelligence will be there by default. The list is incomplete without mentioning AI. Today, it is one of the hottest technologies and is used as a core component in almost every digital transformation strategy. Enterprises are increasingly are implementing AI to automate their business processes, reduce costs and accelerate time to market. Research predicts that Artificial Intelligence-derived business value will total $3.9 trillion by 2022. 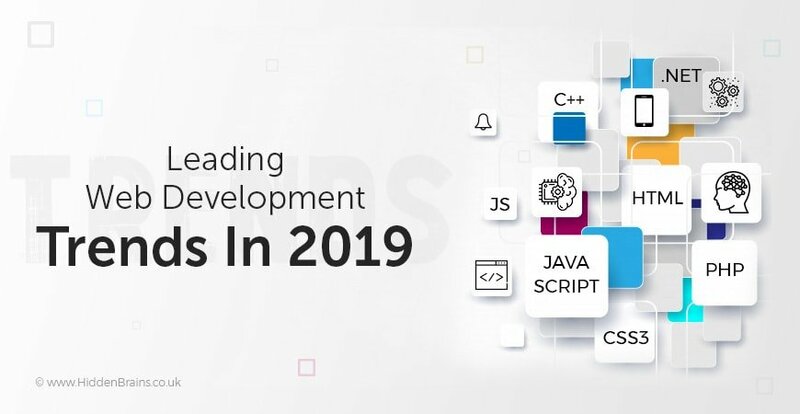 In 2019, AI will play a major role, with significant focus in web development arena like never before. Companies will leverage the power of AI in web development to improve productivity and customer satisfaction. Last year in 2018, Google rolled out mobile-first indexing. This move came in as a part of prioritizing content and links from mobile website pages. We can expect this change to be carried over to 2019. This will also require web designers to give priority to the mobile version of websites. According to stats, more than 50% of global website traffic comes from mobile devices. This implies that SEO will not be the only factor which will dictate the priority of web design. Insightful visual effects and search experience for mobile users will be given priority. When it comes to consumer experience and customer satisfaction, businesses today need to understand the importance of instant gratification. Customers instantly want what they are looking for and do not have the patience to wait. This gives business owners a small window of time to capture their attention and provide them with what they’re looking for. To gratify this idea, animated GIFs are the best bet one can place. GIFs can convey complex ideas in a short period of time while being engaging and entertaining at the same time. These GIFs work seamlessly on most browsers and mobile devices, making them accessible to everyone. In the coming years we will seen an increased use of GIFs in websites in order to explain products & services. Machine Learning or shortly known as ML, is the next big thing after AI. Aided with artificial intelligence, more and more companies are inclined towards using chatbots or conversational bots on their website. Thanks to the huge advancements in artificial intelligence and the capabilities of bots, chatting with bots has become common. Companies are experiencing the benefits that these bots bring to their organization including like greater convenience by giving users instant responses, improved efficiency by allowing for easier and time-saving transitions between different cases. Website owners have realised the use of push notifications and are encouraging their visitors to take an action. Traditional push notifications have helped websites to gain momentum and have proven as a pathbreaking component over the years. Push notifications today are worthy enough to replace the traditional email newsletters. Push notifications to notify suggest users with new content, offers and promotions. This is going to be a trending feature web development as most of the websites will be looking to use it. Business owners and individuals have been experimenting to establish new fonts. Also, illustrations and animations are being added along with adaptability, various trends of website designing curbed to neglect the typography clearly. PWAs provide complete adaptability to a plethora of smart devices, native user experience as well as autonomy; even where the applications are updated independently. These innovative web apps provide complete security through HTTPS as well as through automatic updates. These are provided via Service Worker API. These web apps don’t need any sort of installation. One crucial aspect which is inevitable but most businesses neglect is that of testing. New and updated features need constant testing. These features, if not handled correctly, can easily frustrate your customers and never bring them back again to your website. In order to provide a seamless experience, make sure you test them before on boarding; hire Qa engineer or make use of online testing tools if need be. For your Web Development requirements, get in touch with our experts.